Iris Apfel is my style inspiration when it comes to designer statement jewelry. Iris is often recognized by her trademark glasses, oversized accessories and unique style. Age is not slowing this 93 year old style icon down a bit. This legendary fashionista, businesswoman and interior designer is not showing any signs of retiring. Iris started a love affair with accessories and designer jewelry during The Great Depression. At a time in history when money was scarce and new clothing was not an option Iris recognized that adding jewelry to an outfit could completely change the look. She was quoted as saying that she considers herself "a champion of individuality". The Metropolitan Museum of Art recognized her by naming a gallery in her honor. Today it is said that Iris owns one of the largest and most extensive collections of designer couture costume jewelry in the world. Iris recently bequeathed the Peabody Essex Museum in Salem, Massachusetts 900 pieces from her personal collection including designs by Lanvin, McQueen, Lagerfeld and more. 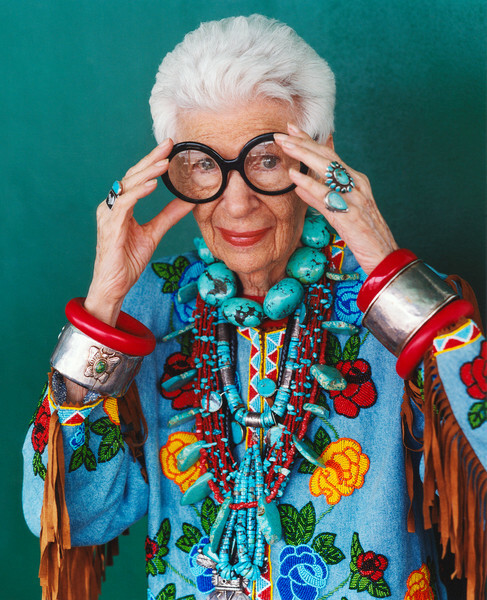 This week a documentary by legendary filmmaker Albert Maysles titled "Iris" is hitting theatres. I cannot wait to see the lady behind the glasses!